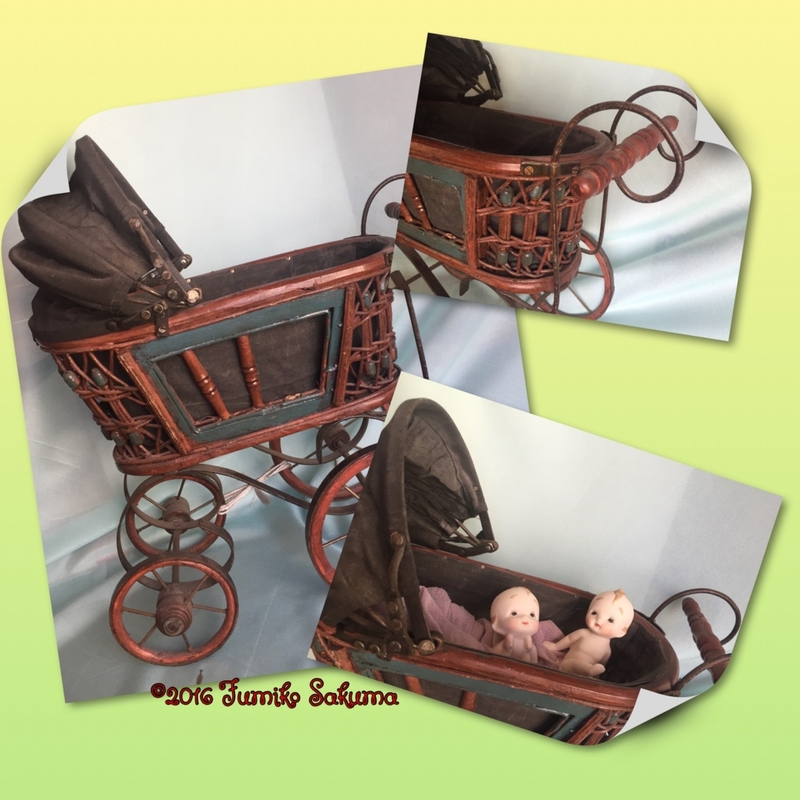 Today I will introduce an item that I bought which is an antique perambulator (baby carriage/cot) that is recently called "buggy" in Japan by young mothers, but "perambulator" or "carriage" seems to be more suitable for this one. I really enjoyed seeing and buying bisque doll-related items at antique shops in U.K. The size of the carriage is around 60cm, which is relatively large, and when put beside a big doll, the doll will look like she is pushing a pram, which can be very cute. In this photo, I have placed small cupy cupids inside. I have made 3 different types of cupids. They are made from 4 separate parts (head, body, hands, and legs) which are made from one mold, then combined as one doll. As referred to in a previous article, the procedure includes 3~4 times of baking/heating, which takes a lot of time, but such effort will be rewarded later on. I remember one of my old friends to whom I have sent the cupid. I bought the carriage at an antique shop fairly close to London called battlesbrige antique center which is about 2 hours by car. My teacher of doll-making in England, Mrs. V Dixon, told me about this antique shop. I had many chances to visit there on Sundays, and I never got tired of seeing the shops. One lady at the shop said in order to make the items seem antique, she would put them outside in sunshine and wind/rain of England. This is a kind of "Aging" technique. The shopping is a very good memory of England!